"How do you post a video on MyChurch?" MyChurch.org is sort of a cross between MySpace and free blogging services like Wordpress.com, with a focus on making it easier for church congregations to collaborate online. MyChurch currently doesn't host videos the way YouTube or MySpace do, but they do provide a fairly easy system for linking to videos from video hosting services like YouTube. If you want to share your own video on MyChurch, you first need to upload the video to someplace like YouTube. After uploading the video follow these steps to link to your video in a MyChurch blog post. After logging in to MyChurch click the Write link to create a new post. Title your post and write any text you want to include about your video. Click the Videos link above the Content window to add a video to your post. 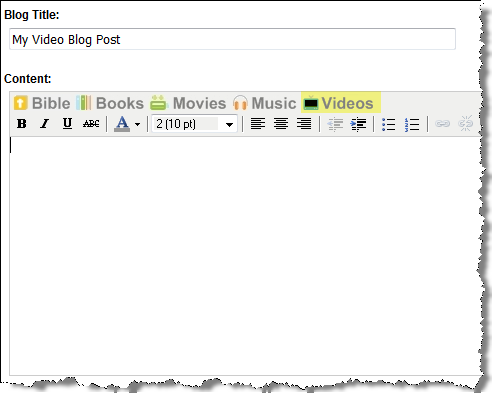 Paste the Web page URL for the YouTube, Metacafe or Google Video you want to post to your blog in the Video URL box and click preview to see the video. Click the Insert Code button to add the video to your MyChurch page.